In the 1881 Census, he is living with his grandparents Thomas and Mary Warburton who were farmers of 22 acres at Vicars Hall Lane, Eccles. Percy worked as a horse-wagon driver between Liverpool and Manchester. He came from a family of horse dealers. He met his future wife, Ann at a pub in Prescot where she was a barmaid and he was a guest. By 1911, he was living at 8 Longton Lane, Rainhill with his wife and children Thomas and Walter Granville. 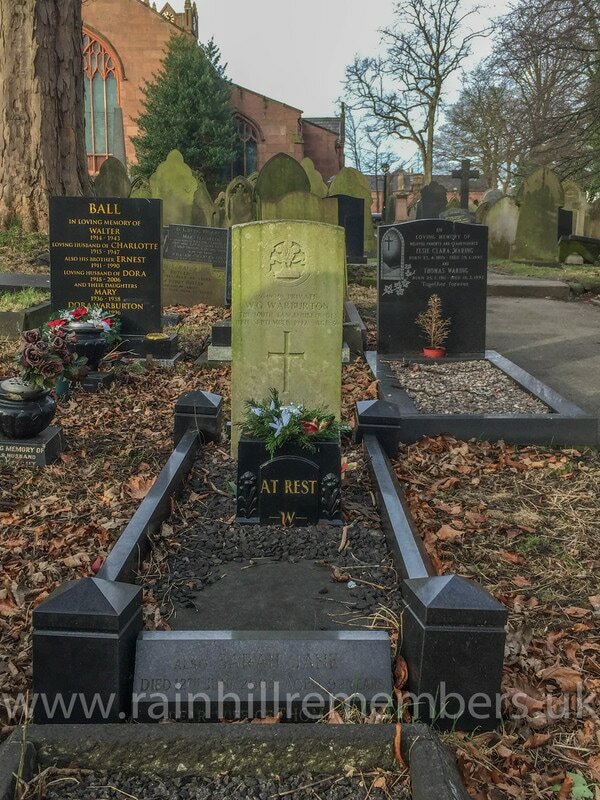 At this time he was an electric cable operative at BICC, Prescot. He joined up in February 1893 in Manchester and served in France. In 1910, he was promoted to Corporal, L/Sgt in 1912 and Sgt in 1914. He spent most of his wartime service in and around Rouen. In September 1915, he suffered a dislocated cartilage of the right knee and spent three weeks in the Military Hospital, Kirkham, Preston. He was in Rouen in 1917 and in January of that year he was transferred to the reserves and dispatched to Dublin before being demobbed in February 1919. His military character had been very good. After the war he became a rope maker. In later life he was devoted to cricket and acquired a library (two bookcases) of classical novels. He became bald and sported a white beard. 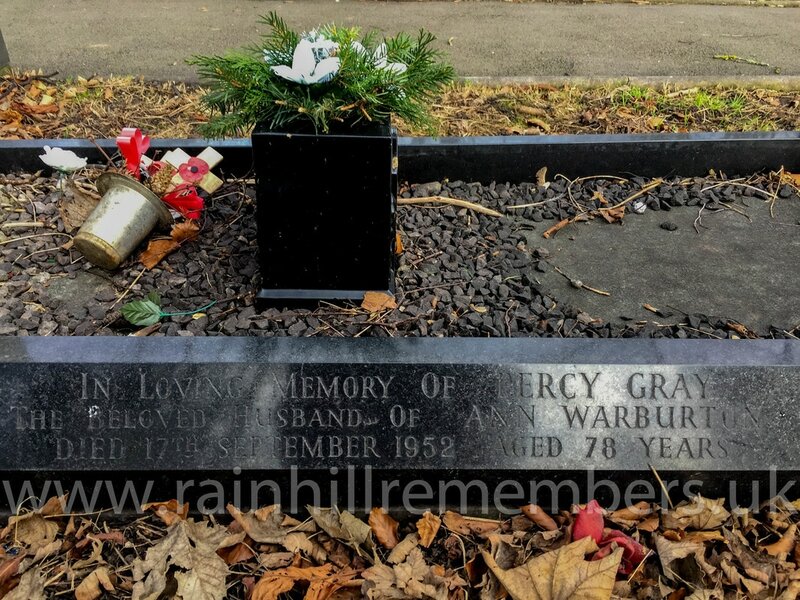 Percy died on 17th September 1952 aged 78 when he was living in Church Villas, Warrington Road, Rainhill and was buried on 22nd September in St. Ann's Churchyard. He received the Victory and the British War Medals. 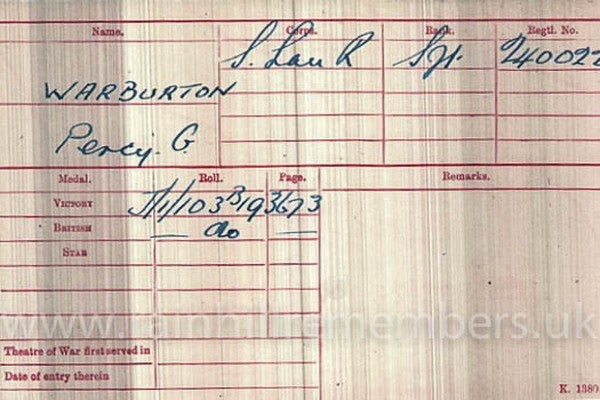 Private Percy Warburton's medal card.